The number one question that will be tossed around among fans this off season will be who will take the helm as the starting QB of the Gamecocks in 2014? With the departure of Connor Shaw, the starting QB position will be open for competition. Shaw finished his career at South Carolina with a 27-5 record as a starting including a perfect 17-0 at Williams-Brice. His talent and ability to win games was impeccable, he could do it with his arm or his legs. His legacy and impact will be felt by the program for a long time to come. Saying that he leaves behind some tough shoes to fill is a huge understatement. So, who will be behind center when the Gamecocks take the field August 28, 2014? When asked this question most fans are going say it's Dylan Thompson's to lose because he has proven that he can be a starting QB in the SEC. He also has shown that he has the talent and leadership necessary to win. But is Dylan really the clear cut leader? Let's run down the depth chart. Heading into winter workouts and spring practice Dylan Thompson is the clear front runner for securing the starting job at QB for the 2014 season. Thompson is entering his 5th year as a Gamecock and has a full understanding of the offense and what the Head Ball Coach wants from his starting QB. Dylan burst onto the scene in 2012 while compiling 1,027, 11 total touchdowns and just 2 interceptions; filling in valuable for an injured Connor Shaw throughout the season. Many fans, such as myself, lobbied for more playing time for the gunslinger during the 2013 season as Connor started slowly out of the gate, but Spurrier stuck with his proven senior QB in Shaw and the Gamecocks ended the 2013 season with 11 wins for the 3rdyear in a row. Thompson did not see nearly the playing time in 2013 that he did in 2012 and when he did see the field he struggled at times. There is no doubt that Thompson is more than capable of leading the 2014 Gamecocks to the mountain top of the SEC . We've all witnessed the talent that Dylan possesses and know he is not afraid of the big stage, just ask any Clemson fan. At times Thompson seems erratic and tries to make all the tough throws, which may result in critical turnovers, but let’s face it, Thompson is a gunslinger and can make all the throws or as I like to say, “ he just grips it and rips it “. Only time will tell whether or not Dylan Thompson will secure and separate himself from the other QB’s as the number one guy during spring and fall camp, but the sky is the limit for this kid and he could easily put up the BIG numbers in a Steve Spurrier offense. The 6’1, 220 pound signal caller from Allentown Pennsylvania will enter spring camp as the number 2 QB on the depth chart followed closely by Connor Mitch. This should be one of the more intriguing battles during the spring, heading into fall camp. Nosovitch played sparingly in 2013 but showed he has a strong arm on a few screen plays as well as the ability to run with the football. During his recruitment Nosovitch was rated the 22nd best dual-threat QB in the country by Rivals.com and the 44th best overall QB by Scout.com. Nosovitch has somewhat of a Tim Tebow type of build and could be a punishing ball carrier, but from watching film it seems as if his arm is the real weapon. Brendan is entering his 3rd year as a Gamecock and should have a firm grasp of the offense, giving him a legitimate shot as a potential starter for the Garnet & Black. Of course Nosovitch will get plenty of snaps and opportunities during spring camp as well as the annual Spring Game to really show what he is capable of bringing to the Gamecock offense. Make no mistake about it, Steve Spurrier wants to throw the ball up and down the field at South Carolina. We should have an explosive run game with Mike Davis and quite possibly our best offensive line ever to play at SC will return next season so Connor will have plenty of time and opportunity to sling the ball around. The 6' 3, 227-pound kid fits the mold for the type of quarterback Spurrier is looking for. Mitch is only the third 4 star quarterback to come to South Carolina but many feel like he could potentially be the best. Mitch put up gaudy numbers at Wakefield High School in Raleigh, NC, throwing for over 12,000 yards and 153 touchdowns in the Wolverines' spread offense. Mitch also gets the ball out quick and makes good decisions, ending his career with almost a 60% completion percentage. Rod Sink, Connor's coach at Wakefield says he has the intangibles to match the talent, providing great leadership on and off the field. He turned down offers from Alabama, Auburn, LSU & Florida to name a few. 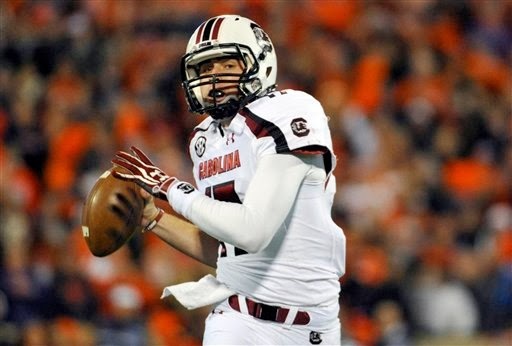 Connor Mitch came to South Carolina to be a starting QB and he will get his opportunity to win the job this fall. Hails is a walk-on from Collinsville, Ill. Who joined the team in 2011 and has spent most of his career on the scout team. The former Athlete of The Year from Illinois adds plenty of depth at the QB position and is a valuable asset to the team from a practice stand point, as well as being involved in getting the play calls in during live games. Barring multiple injuries, Hails may only see mop up duty throughout his career as he is buried on the depth chart behind the likes of Thomspon, Nosovitch, Mitch, and incoming freshman Michael Scarnecchia. None the less every member of the team is an asset and contributes in more ways than one. Scarnecchia is a 6' 4", 192-pound quarterback from Fleming Island, Florida. After summer camp he was offered a scholarship personally by Spurrier and became the first and only Quarterback of the 2014 recruiting class. Like Mitch, Scarnecchia is a pro-style quarterback and likes to throw the ball around. Michael doesn't have the gaudy numbers as some of the other quarterbacks but they ran the ball as much as they threw it at Fleming Island High. He is known for his strong and accurate arm and has really impressed the coaching staff at South Carolina. He is an under the radar type of player with not many offers but has the talent needed to play at a high level. He looks impressive on tape and just might be a diamond in the rough. I'm excited to see what the coaching staff will do with him. With the depth we have at the position more than likely he will red shirt this season but keep your eye on this kid, he could have a bright future at South Carolina. Perry Orth is a walk-on from Ponde Verda, FL. who is a great team guy and asset to this program. Just because you may not see a lot of playing time doesn't mean you add a lot of value to this team. His role reminds me a lot of Seth Strickland, he is a scout team guy but has the tools to get the job done if his number is called. Orth has impressed at practice but will be fighting to climb the depth chart next season. We are lucky to have Perry Orth at South Carolina and wish him nothing but the best during his time here. Sound off Gamecock Nation and let us know below who you think will start at why!